Nutanix (NTNX) reported a 2nd Quarter January 2019 loss of $0.23 per share on revenue of $335.4 million. The consensus estimate was a loss of $0.25 per share on revenue of $331.0 million. The Earnings Whisper number was for a loss of $0.22 per share. Revenue grew 17.0% on a year-over-year basis. The company said it expects a third quarter non-GAAP loss of approximately $0.60 per share on revenue of $290.0 million to $300.0 million. The current consensus estimate is a loss of $0.28 per share on revenue of $347.3 million for the quarter ending April 30, 2019. SAN JOSE, Calif.--(BUSINESS WIRE)-- Nutanix, Inc. (NASDAQ: NTNX), a leader in enterprise cloud computing, today announced financial results for its second quarter of fiscal 2019, ended January 31, 2019. 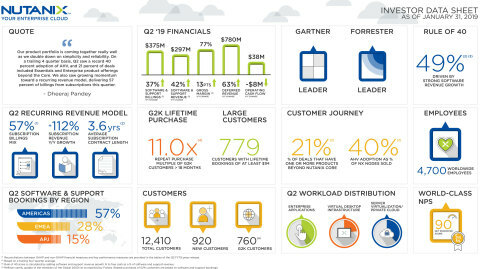 Expanded Customer Base: Nutanix ended Q2 FY’19 with 12,410 end-customers, adding 920 new end-customers during the quarter. Customer wins included Apache Corporation, GS Energy Corporation, Harris Corporation, IHG, Komatsu America Corp., and Nedbank. Continued Momentum in $1 Million+ Customers: Our number of customers with at least $1 million in lifetime spend reached 779 during Q2 FY’19, growing 44% year-over-year. Six customers purchased at least $5 million of products and services during the quarter as they continued their datacenter modernization journey with Nutanix. Launched “You Decide” Campaign to Expand Brand Reach into Market: This new campaign promotes expanded customer choice in server vendor, hypervisor and cloud provider. It is designed to increase lead generation returns by highlighting the financial, operational and personal benefits of the Nutanix platform. Received 2018 Product of the Year for Nutanix Era: CRN honored Nutanix Era as the winner of the publication’s Hyperconverged Infrastructure category for its 2018 Product of the Year Awards. This award recognizes products and services that demonstrate best-in-breed technological innovation, financial opportunity for partners, and customer demand. Recognized by Forbes on its Just 100: Forbes recognized Nutanix on its Just 100 list, which honors America’s best corporate citizens among the Russell 1000 based on positive employee treatment, customer treatment and job creation. Named a Leader in the Gartner Magic Quadrant for Hyperconverged Infrastructure2: Nutanix believes its placement as a Leader for the second time in a row is strong validation of its continued dominance in the market it pioneered and its vision to deliver a true hybrid cloud experience so IT teams can seamlessly deliver applications across platforms. 1Based on a trailing four-quarter average. 2The Gartner reference(s) described herein, (the "Gartner Reference(s)") represent(s) research opinion or viewpoints published, as part of a syndicated subscription service, by Gartner, Inc. ("Gartner"), and are not representations of fact. Each Gartner Reference speaks as of its original publication date (and not as of the date of this press release) and the opinions expressed in the Gartner Reference(s) are subject to change without notice. Gartner does not endorse any vendor, product or service depicted in its research publications, and does not advise technology users to select only those vendors with the highest ratings or other designation. Gartner research publications consist of the opinions of Gartner's research organization and should not be construed as statements of fact. Gartner disclaims all warranties, expressed or implied, with respect to this research, including any warranties of merchantability or fitness for a particular purpose. Supplementary materials to this earnings release, including the company’s second quarter fiscal 2019 investor presentation, can be found at https://ir.nutanix.com/company/financial. All forward-looking non-GAAP financial measures contained in the section titled "Q3 Fiscal 2019 Financial Outlook" exclude stock-based compensation expense and amortization of intangible assets and may also exclude, as applicable, other special items. The company has not reconciled guidance for billings, non-GAAP gross margin, non-GAAP operating expenses and non-GAAP loss per share to their most directly comparable GAAP measures because such items that impact these measures are not within its control and are subject to constant change. While the actual amounts of such items will have a significant impact on the company’s billings, non-GAAP gross margin, non-GAAP operating expenses and non-GAAP loss per share, a reconciliation of the non-GAAP financial measure guidance to the corresponding GAAP measures is not available without unreasonable effort. Nutanix executives will discuss the company’s second quarter fiscal 2019 financial results on a conference call at 4:30 p.m. Eastern Time/1:30 p.m. Pacific Time today. To listen to the call via telephone, dial 1-833-227-5841 in the United States or 1-647-689-4068 from outside the United States. The conference ID is 6887822. This call will be webcast live and available to all interested parties on our Investor Relations website at ir.nutanix.com. Shortly after the conclusion of the conference call, a replay of the audio webcast will be available on the Nutanix Investor Relations website. A telephonic replay will be available for one week by calling 1-800-585-8367 or 1-416-621-4642, and entering the conference ID 6887822. To supplement our condensed consolidated financial statements, which are prepared and presented in accordance with GAAP, we use the following non-GAAP financial and other key performance measures: billings, non-GAAP gross margin, non-GAAP operating expenses, non-GAAP net loss, non-GAAP net loss per share, free cash flow, software and support revenue, software and support billings, and subscription and professional services billings. In computing these non-GAAP financial measures and key performance measures, we exclude certain items such as stock-based compensation and the related income tax impact, costs associated with our acquisitions (such as amortization of acquired intangible assets, revaluation of contingent consideration, income tax-related impact, and other acquisition-related costs), amortization of debt discount and issuance costs, other non-recurring transactions and the related tax impact, and the revenue and billings associated with pass-through hardware sales. Billings is a performance measure which our management believes provides useful information to investors because it represents the amounts under binding purchase orders received by us during a given period that have been billed, and we calculate billings by adding the change in deferred revenue between the start and end of the period to total revenue recognized in the same period. Free cash flow is a performance measure that our management believes provides useful information to management and investors about the amount of cash generated by the business after necessary capital expenditures, and we define free cash flow as net cash (used in) provided by operating activities less purchases of property and equipment. Non-GAAP gross margin, non-GAAP operating expenses, non-GAAP net loss, and non-GAAP net loss per share are financial measures which our management believes provide useful information to investors because they provide meaningful supplemental information regarding our performance and liquidity by excluding certain expenses and expenditures such as stock-based compensation expense that may not be indicative of our ongoing core business operating results. Software and support revenue and software and support billings are performance measures that our management believes provide useful information to our management and investors as it allows us to better track the true growth of our software business by excluding the amounts attributable to the pass-through hardware sales that we use to deliver our solutions. Subscription and professional services billings are performance measures that our management believes provide useful information to our management and investors as it allows us to better track the growth of the subscription-based portion of our business, which is a critical part of our business plan. We use these non-GAAP financial and key performance measures for financial and operational decision-making and as a means to evaluate period-to-period comparisons. However, these non-GAAP financial and key performance measures have limitations as analytical tools and you should not consider them in isolation or as substitutes for analysis of our results as reported under GAAP. Billings, non-GAAP gross margin, non-GAAP operating expenses, non-GAAP net loss, non-GAAP net loss per share, and free cash flow are not substitutes for total revenue, gross margin, operating expenses, net loss, net loss per share, or net cash (used in) provided by operating activities, respectively, software and support revenue and software and support billings are not substitutes for total revenue, and subscription and professional services billings are not a substitute for subscription and professional services revenue. In addition, other companies, including companies in our industry, may calculate non-GAAP financial measures and key performance measures differently or may use other measures to evaluate their performance, all of which could reduce the usefulness of our non-GAAP financial measures and key performance measures as tools for comparison. We urge you to review the reconciliation of our non-GAAP financial measures and key performance measures to the most directly comparable GAAP financial measures included below in the tables captioned “Reconciliation of Revenue to Billings,” “Disaggregation of Revenue and Billings,” “Reconciliation of Subscription and Professional Services Revenue to Subscription and Professional Services Billings,” “Reconciliation of Software and Support Revenue to Software and Support Billings,” “Reconciliation of GAAP to Non-GAAP Profit Measures,” and “Reconciliation of GAAP Net Cash Provided By Operating Activities to Non-GAAP Free Cash Flow,” and not to rely on any single financial measure to evaluate our business. This press release contains express and implied forward-looking statements, including, but not limited to, statements regarding our business plans and objectives, the benefits and capabilities of our platform, products, services and technology, our continued investment in talent, technology, and marketing, our plans and timing for, and the success and impact of, our transition to a subscription-based and recurring revenue business model, any impact of the actions we have undertaken to address inadequate marketing spending for pipeline generation and slower than expected sales hiring, and anticipated future financial results, including but not limited to our guidance on estimated revenues, billings, non-GAAP gross margin, non-GAAP operating expenses and non-GAAP net loss per share for future fiscal periods. These forward-looking statements are not historical facts and instead are based on our current expectations, estimates, opinions, and beliefs. Consequently, you should not rely on these forward-looking statements. The accuracy of such forward-looking statements depends upon future events and involves risks, uncertainties, and other factors beyond our control that may cause these statements to be inaccurate and cause our actual results, performance or achievements to differ materially and adversely from those anticipated or implied by such statements, including, among others: failure to develop, or unexpected difficulties or delays in developing, new products, services, product features or technology in a timely or cost-effective basis; delays in or lack of customer or market acceptance of our new products, services, product features or technology; delays in the transition to focus primarily on software-only transactions and a subscription-based and recurring revenue business model; failure of the actions we have undertaken to address inadequate marketing spending for pipeline generation and slower than expected sales hiring to yield the results we expect; the rapid evolution of the markets in which we compete; our ability to sustain or manage future growth effectively; factors that could result in the significant fluctuation of our future quarterly operating results, including, among other things, anticipated changes to our revenue and product mix which will slow revenue growth during such transition and make forecasting future performance more difficult, the timing and magnitude of orders, shipments and acceptance of our solutions in any given quarter, our ability to attract new and retain existing end-customers, changes in the pricing of certain components of our solutions, and fluctuations in demand and competitive pricing pressures for our solutions; the introduction, or acceleration of adoption of, competing solutions, including public cloud infrastructure; and other risks detailed in our quarterly report on Form 10-Q for the fiscal quarter ended October 31, 2018, filed with the SEC on December 10, 2018. Additional information will also be set forth in our Form 10-Q that will be filed for the quarter ended January 31, 2019, which should be read in conjunction with these financial results. Our SEC filings are available on the Investor Relations section of the company’s website at ir.nutanix.com and on the SEC's website at www.sec.gov. These forward-looking statements speak only as of the date of this press release and, except as required by law, we assume no obligation to update forward-looking statements to reflect actual results or subsequent events or circumstances. © 2019 Nutanix, Inc. All rights reserved. Nutanix, the Nutanix logo, Nutanix Era, and all product and service names mentioned herein are registered trademarks or trademarks of Nutanix, Inc. in the United States and other countries. All other brand names mentioned herein are for identification purposes only and may be the trademarks of their respective holder(s). (1) During the first quarter of fiscal 2019, we adopted Accounting Standards Update (ASU) No. 2016-18, which requires that the statement of cash flows explain the change during the period in the total of cash, cash equivalents and restricted cash. We adopted the standard retrospectively for the prior period presented. Our adoption of ASU 2016-18 did not have any significant impact on our consolidated statement of cash flows. (2) Included within other assets—non-current in the condensed consolidated balance sheets. (1) Amount for the six months ended January 31, 2019 excludes approximately $0.3 million of deferred revenue assumed in the Frame acquisition. Subscription — Subscription revenue is generated from the sales of software entitlement and support subscriptions, separately purchased software term-based licenses and cloud-based Software as a Service, or SaaS offerings. We recognize revenue from software entitlement and support subscriptions and SaaS offerings ratably over the contractual service period, while revenue from our separately purchased software term-based licenses is generally recognized upon transfer of control to the customer, which is when we make the software available to our customers. Non-portable software — Non-portable software revenue includes sales of our software operating system when delivered on a configured to order appliance by us, or one of our OEM partners. The software licenses associated with these sales are typically non-portable and have a term equal to the life of the appliance it is delivered on. Revenue from our non-portable software products is generally recognized upon transfer of control to the customer. Hardware — In transactions where we deliver the hardware appliance, we consider ourselves to be the principal in the transaction and we record revenue and costs of goods sold on a gross basis. We consider the amount allocated to hardware revenue to be equivalent to the cost of the hardware procured. Hardware revenue is generally recognized upon transfer of control to the customer. Professional services — We also sell professional services with our products. We recognize revenue related to professional services as they are performed. (2) Approximately $3.4 million of hardware was included in deferred revenue as of January 31, 2018. (3) Software and support revenue and billings include software and support, entitlements and other services revenue and billings.